Gunyoung Kim was born and raised in Seoul, South Korea. She received her Bachelors of Fine Art in Ceramics from Kook-Min University in Korea in 2010 and her MFA from The Ohio State University in 2014 where she developed her studio practice and gained teaching experience. 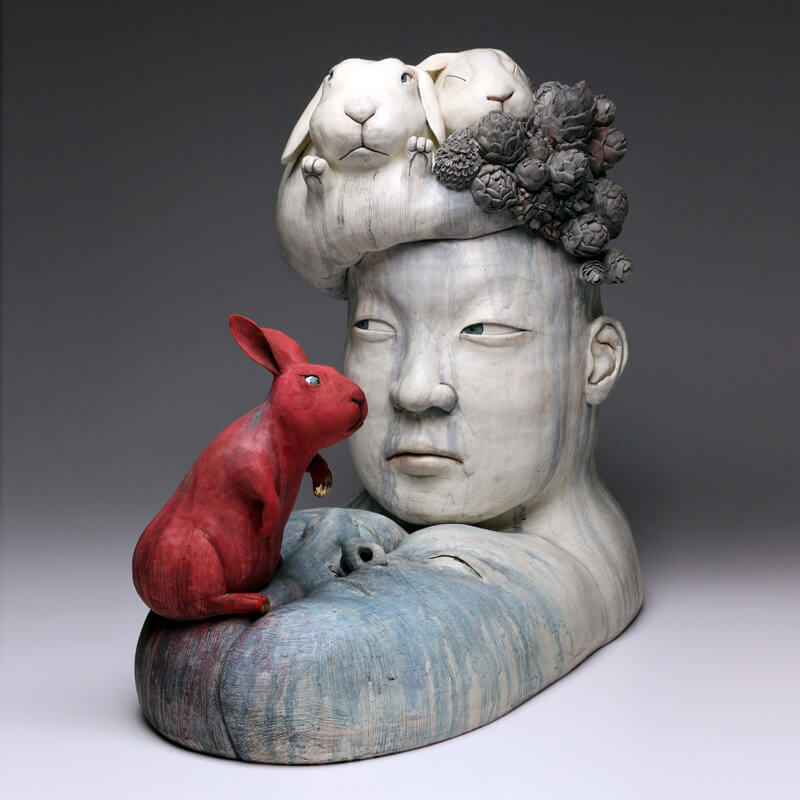 After graduate school, Gunyoung was the long-term ceramic artist-in-residence at Lawrence Art Center in Lawrence, Kansas. She also completed a short-term residency at the Archie Bray Foundation in Helena, MT. Gunyoung was selected as one of the 2016 Ceramics Monthly Emerging Artists and she received the Individual Excellence Award from the Ohio Arts Council. She currently resides in Columbus, OH. Over the last several years I’ve been developing figurative work that explores human emotions that are subtle and ambiguous. My work is often about myself and I strongly feel my emotions come from connections that exist between humans, objects, and environments. I focus on inner aspects of human beings through facial expressions, gestures, staging, and disfigurement. In my work, fragments of the body are often exaggerated and distorted in order to heighten physiological changes associated with internal emotions. Among the body fragments that I use, the face is a significant vehicle for bringing emotional quality to my sculpture. Human emotions are so complicated. Our reactions to the world we find ourselves in are so multi-layered that we sometimes don’t even understand our own emotional states and feelings. This complexity and ambiguity comes from vulnerability of the human psyche with all its imperfections, and I’m interested in putting these ideas into physical forms emphasizing them through placement and tactile manipulation.